The other day, through no fault of my own, I found myself looking at the courses required by our molecular biology undergraduate degree program. I discovered a requirement for a 5 credit hour physics course, and a recommendation that this course be taken in the students' senior year – a point in their studies when most have already completed their required biology courses. Befuddlement struck me, what was the point of requiring an introductory physics course in the context of a molecular biology major? Was this an example of time-travel (via wormholes or some other esoteric imagining) in which a physics course in the future impacts a students' understanding of molecular biology in the past? I was also struck by the possibility that requiring such a course in the students' senior year would measurably impact their time to degree. In a search for clarity and possible enlightenment, I reflected back on my own experiences in an undergraduate biology degree program – as a practicing cell and molecular biologist, I was somewhat confused. I could not put my finger on the purpose of our physics requirement, except perhaps the admirable goal of supporting physics graduate students. But then, after feverish reflections on the responsibilities of faculty in the design of the courses and curricula they prescribe for their students and the more general concepts of instructional (best) practice and malpractice, my mind calmed, perhaps because I was distracted by an article on Oxford Nanopore's MinION (→) "portable real-time device for DNA and RNA sequencing", a device that plugs into the USB port on one's laptop! Distracted from the potentially quixotic problem of how to achieve effective educational reform at the undergraduate level, I found myself driven on by an insatiable curiosity (or a deep-seated insecurity) to ensure that I actually understood how this latest generation of DNA sequencers worked. This led me to a paper by Meni Wanunu (2012. Nanopores: A journey towards DNA sequencing). On reading the paper, I found myself returning to my original belief, yes, understanding physics is critical to developing a molecular-level understanding of how biological systems work, BUT it was just not the physics normally inflicted upon (required of) students. Certainly this was no new idea. Bruce Alberts had written on this topic a number of times, most dramatically in his 1989 paper "The cell as a collection of molecular machines". Rather sadly, and not withstanding much handwringing about the importance of expanding student interest in, and understanding of, STEM disciplines, not much of substance in this area has occurred. While (some minority of) physics courses may have adopted active engagement pedagogies, in the meaning of Hake, most insist on teaching macroscopic physics, rather than to focus on, or even to consider, the molecular level physics relevant to biological systems, explicitly the physics of protein machines in a cellular (biological) context. Why sadly? Because conventional, that is non-biologically relevant introductory physics and chemistry courses, all too often serve the role of a hazing ritual, driving many students out of the biological sciences, in part I suspect because they often seem irrelevant to students' interests in the workings of biological systems. Nanopore's sequencer and Wanunu's article got me thinking again about biological machines, of which there are a great number, ranging from pumps, propellers, and oars to various types of transporters, molecular truckers that move chromosomes, membrane vesicles, and parts of cells with respect to one another, to DNA detanglers, protein unfolders, and molecular recyclers (→). The Nanopore sequencer works because as a single strand of DNA (or RNA) moves through a narrow pore, the different bases (A,C,T,G) occlude the pore to different extents, allowing different numbers of ions, different amounts of current, to pass through the pore. These current differences can be detected, and allows for nucleotide sequence to be read as the nucleic acid strand moves through the pore. Understanding the process involves understanding how molecules move, that is the physics of molecular collisions and energy transfer, how proteins and membranes allow and restrict ion movement, and the impact of chemical gradients and electrical fields across a membrane on molecular movements – all physical concepts of widespread significance in biological systems. Such ideas can be extended to the more general questions of how molecules move within the cell, and the effects of molecular size and inter-molecular interactions within a concentrated solution of proteins, protein polymers, lipid membranes, and nucleic acids, such as described in Oliverira et al., Increased cytoplasm viscosity hampers aggregate polar segregation in Escherichia coli . At the molecular level the processes, while biased by electric fields (potentials) and concentration gradients, are stochastic (noisy). Understanding of stochastic processes is difficult for students, but critical to developing an appreciation of how such processes can lead to phenotypic differences between cells with the same genotypes (previous post) and how such noisy processes are managed by the cell and within a multicellular organism. As path leads on to path, I found myself considering the (← adapted from Joshi et al., 2017) spear-chucking protein machine present in the pathogenic bacteria Vibrio cholerae; this molecular machine is used to inject toxins into neighbors that the bacterium happens to bump into (see Joshi et al., 2017. Rules of Engagement: The Type VI Secretion System in Vibrio cholerae). The system is complex and acts much like a spring-loaded and rather "inhumane" mouse trap. This is one of a number of bacterial type VI systems, and "has structural and functional homology to the T4 bacteriophage tail spike and tube" – the molecular machine that injects bacterial cells with the virus's genetic material, its DNA. Building the bacterium's spear-based injection system is controlled by a social (quorum sensing) system (previous post). One of the ways that such organisms determine whether they are alone or living in an environment crowded with other organisms. During the process of assembly, potential energy, derived from various chemically coupled, thermodynamically favorable reactions, is stored in both type VI "spears" and the contractile (nucleic acid injecting) tails of the bacterial viruses (phage). Understanding the energetics of this process, for example, how coupling thermodynamically favorable chemical reactions, such as ATP hydrolysis, or physico-chemical reactions such as the diffusion of ions down an electrochemical gradient, can be used to set these "mouse traps", and understanding where the energy goes when the traps are sprung is central to students' understanding of these and a wide range of other molecular machines. 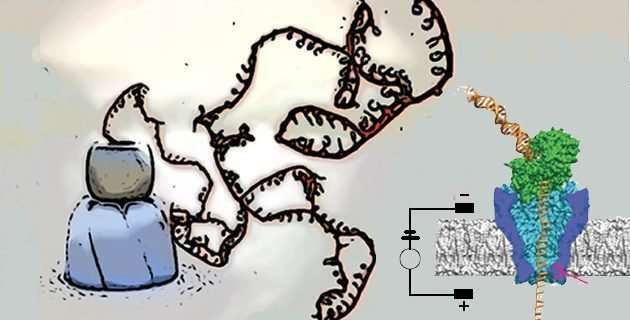 Energy stored in such molecular machines during their assembly can be used to move the cell. As an example, another bacterial system generates contractile (type IV pili) filaments; the contraction of such a filament can allow "the bacterium to move 10 000 times its own body weight, which results in rapid movement" (see Berry & Belicic 2015. Exceptionally widespread nanomachines composed of type IV pilins: the prokaryotic Swiss Army knives). The contraction of such a filament has also been found to be used to import DNA into the cell, the first step in the process of horizontal gene transfer. In other situations (other molecular machines) such protein filaments access thermodynamically favorable processes to rotate, acting like a propeller, driving cellular movement. During my biased random walk through the literature, I came across another, but molecularly distinct, machine used to import DNA into Vibrio (see Matthey & Blokesch 2016. The DNA-Uptake Process of Naturally Competent Vibrio cholerae). This molecular machine enables the bacterium to import DNA from the environment, released, perhaps, from a neighbor killed by its spear. 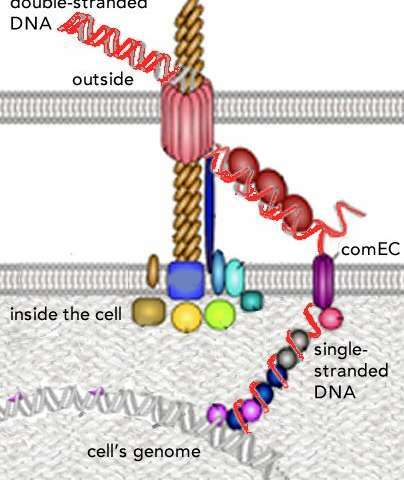 In this system (adapted from Matthey & Bioesch et al., 2017 →), the double stranded DNA molecule is first transported through the bacterium's outer membrane ("OM"); the DNA's two strands are then separated, and one strand passes through a channel protein through the inner (plasma) membrane, and into the cytoplasm, where it can interact with the bacterium's genomic DNA. The value of introducing students to the idea of molecular machines is that it can be used to demystify how biological systems work, how such machines carry out specific functions, whether moving the cell or recognizing and repairing damaged DNA. If physics matters in biological curriculum, it matters for this reason – it establishes th e core premise of biology that organisms are not driven by "vital" forces, but by prosaic physiochemical ones. At the same time, the molecular mechanisms behind evolution, such as mutation, gene duplication, and genomic reorganization, provide the means by which new structures emerge from pre-existing ones, yet many is the molecular biology degree program that does not include an introduction to evolutionary mechanisms in its required course sequence – imagine that, requiring physics but not evolution? One final point regarding requiring students to take a biologically relevant physics course early in their degree program is that it can be used to reinforce what I think is a critical and often misunderstood point. While biological systems rely on molecular machines, we (and by we I mean all organisms) are NOT machines, no matter what physicists might postulate – see We Are All Machines That Think. We are something different and distinct. Our behaviors and our feelings, whether ultimately understandable or not, emerge from the interaction of genetically encoded, stochastically driven non-equilibrium systems, modified through evolutionary, environmental, social, and a range of unpredictable events occurring in an uninterrupted, and basically undirected fashion for ~3.5 billion years. While we are constrained, we are more, in some weird and probably ultimately incomprehensible way.